In our efforts to get the shot, we get bug-bitten, muddy, and yes, our parade often gets rained on. Some try and protect their gear with bulletproof, waterproof hard cases, such as those by Pelican, that solve the weather problems, but create another - - - they’re not particularly easy to carry long distances or over rough terrain. Others go for one of the exceptional backpack-style carriers, such as those from Lowepro. While weatherproof, they’re not exactly waterproof. Until now . . .
Lowepro recently announced the DryZone 200, which combines the comfort and carrying capacity of their backpacks with an honest-to-goodness waterproof zipper to give you the best of both worlds. You might have seen it on Lowepro's recently updated home page www.lowepro.com. If not, check it out. Outwardly, the DryZone 200 resembles one of the standard Lowepro Trekker backpacks, and has about the same internal dimensions as the Nature Trekker AW. I was fortunate enough to be able to try a pre-production model on a recent fishing/photography trip to northern Colorado, where it proved to be the cat’s meow. Upon the bag’s arrival, my first reaction was “This sucker is big; or at least it’s thick.” Space was not lacking, at least for what I carry. The DryZone 200 neatly held 2 bodies, a 17-35, 60 macro, 28-70, 80-400, SB-28, plus assorted batteries, cables, filters, plenty of film, paperback and other miscellany. Oh yes, and a Coolpix snapshooter, as I’m still trying to ease my way into digital competence. I spent a fair amount of time trying out the bag’s seemingly complex connectors, and the more I did, the more I understood Lowepro put a lot of thought into the pack. There are essentially three “layers” to the bag (see photo). 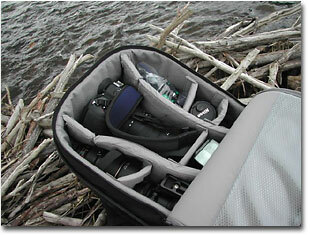 The inside one contains the familiar Lowepro easily adjustable dividers. The compartment has a simple padded, zippered cover. Image the familiar backpack shape, but with no outer pockets, straps or such; that’s what the inner layer looks like. The second layer is the waterproof one. It’s constructed of a tough rubberized material, similar to that found in waterproof boat bags. It fits comfortably around the inner layer and has its own zipper. But this one isn’t your ordinary toothed zipper. It’s a hi-tech TIZIP™ zipper (see photo), and is completely waterproof. 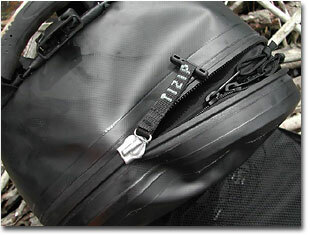 The TIZIP requires more effort than a regular zipper to open or close, as evidenced by the over-sized T-shape zipper pull, but once closed, it is watertight. The third and outer layer has no zipper, but instead a h andy snap-lock connected just under the carrying handle. The outer cover has the standard Lowepro zippered flat pockets, handy for holding filters, cords, pens, a mini-flashlight, or whatever. This cover also has a larger zippered outer pocket, which is large enough to hold a rain jacket, dozens of rolls of film, candy bars, and other essentials. It also has two mesh pockets on the outside for water bottles or other accessories. Sounds complicated, and it is, but the trick is to only close those layers you need to. Then it’s simple. For instance, if you’re not going near the water, or out into the rain, there’s no need to hassle with fastening the TIZIP™ zipper. Simply zip the inner zipper (it keeps dust and grime out), flip the rubberized cover up, and secure everything with the snap lock. If you’re near the water, fastening the inner zipper is optional, but you’ll definitely want to fasten the TIZIP™ zipper and again, snap the outer cover closed. The rest of the DryZone 200 is vintage Lowepro, with their typical sturdy adjustable harness and waistband, with adjustments enough so that anyone can find comfort. Waiting in line to check bags at the ticket counter, I kept glancing from the backpack to the “fitting” box at the counter and back. It didn’t look good-thick backpack, skinny box, thick backpack, skinny box. To make matters worse, I remembered Lowepro’s web site didn’t have the little airplane icon beside the DryZone 200. I had even asked the Lowepro tech rep about that, and he said, “Well, those guys are getting a bit conservative. It should be OK.” It still didn’t look particularly OK. Finally, I did what any red-blooded air traveler would do. I kept the bag on the floor, scooting it along the floor to the counter, said I had one bag to check and one carry-on. No sweat. Now all I had to do was get through the gate. No problem there either. I simply got behind the person who appeared to have the most carry-on luggage, slipped the DryZone 200 over the shoulder opposite the gate attendant, kept sideways to her, and breezed through, appearing positively compact in comparison to the previous passenger. So far, so good. After the flight from RDU to DFW, the leg to DEN was on an MD-80 (as were both legs home), and the DryZone 200 fit handily in the overhead rack. I experienced no problem with air travel. To be honest, after the worries with the travel, the rest of the trip was a breeze. I was floating a couple of streams courtesy of Cabela’s and The Creek Company, trying out the latter’s new two-man pontoon boat (that’s The Creek Company’s Chris Timmerman beside his new boat, holding up a nice brown trout). If you’ve ever seen a small one- or two-man pontoon boat, you’ll know that they are made with fishing, and not dry storage, in mind. But with the DryZone 200, there was no worry. I simply slung it over the seat back and went fishing. If a shot presented itself, it was relatively easy to snap open the outer cover, unzip the TIZIP™ zipper, and take the shot. No worry about the bag leaking, or even slipping into the water (Lowepro says it will float with 80 pounds inside). We frequently stopped and wade fished as well. There, I just slipped the backpack over my shoulders. 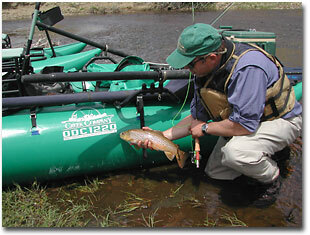 Those who’ve waded a trout stream know they can be slippery devils, even with felt soles on. But I fished without a worry, knowing the bag was well-padded and w-a-t-e-r-p-r-o-o-f! After decades of searching for the right solution, it was a nice feeling. Whether you’re on a trout stream, in a duck blind, or just chancing being caught in a thunderstorm, you know the water is pretty much as wet in one place as another. And if you worry about dousing your equipment in such places, you might find yourself avoiding all or part of it at home. If you do, or if you simply want the added security, consider the new DryZone 200. Stay dry. Stay cool. Get the shot.